As one of the nation's fastest growing cities and the third largest in the state of Arizona, Mesa enjoys the best in a variety of amenities; restaurants with every type of food you can imagine, parks within easy walking distance from home, a variety of sports facilities that cater to athletes young and old, highly rated golf courses for every skill level, a diversity of special events, and Mesa' ever-popular Chicago Cubs Spring Training baseball. Mesa today is unique among cities in the Phoenix Metroplex as it offers area guests great outdoor activities such as hiking and boating. Visitors to this recreation mecca can also enjoy horseback riding, a paddle wheel boat ride, wilderness Jeep tours, or teeing off at one of the more than 40 golf courses within a half-hour drive. The mysterious Superstition Mountains, located 20 minutes from downtown and home to the famous Lost Dutchman Gold Mine, have numberous hiking trails and exciting places to explore. Four lakes are also situated in the Superstitions and each has excellent boating and fishing. 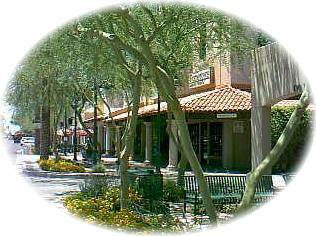 While Mesa is located next to the Tonto National Forest and offers the feel of a small community, the city is thriving and dynamic. There are 70 hotels, resorts and motels varying in amenities from first-class, full-service properties to cozy inns. The first known settlement in the Mesa area was about 2,000 years ago. An Indian civilization now called the Hohokam (Pima language meaning - those who are gone), built an empire that lasted 1,500 years. The agriculturally oriented Hohokam engineered hundreds of miles of irrigation canals, cultivating thousands of acres of land. Although an advanced civilization, the Hohokams vanished because of drought or flooding, or a combination of both, between 1400 and 1500 A.D.
Mormon pioneers arriving in 1877 excavated the ancient Hohokam canals, again bringing irrigation and ensuring the rebirth of a community. When these early settlers made camp along the river, they referred to the land above the bluff as the "mesa," a Spanish word meaning "table." The town was incorporated in 1883. In 1912, one of Mesa's earliest cotton gins was purchased and soon thousands of acres of land were planted with cotton. Cotton and citrus were two of Mesa's most important crops. Because of the war in Europe, two military airports were built near Mesa in 1941, Williams Field was constructed to train American pilots and British pilots trained at Falcon Field. Falcon Field closed after the war and was converted into a municipal airport. In 1994, Williams Field became Williams Gateway Airport. In 1952, Mesa became the Spring Training home of the Chicago Cubs, and the course of sports history for the city was changed forever. Today, Mesa and the Cubs, along with eleven other Major League teams, provide fans with the ultimate in Spring Training action during March of each year. The thirst for the thrill of America's pastime can even be quenched during the off-season! For over 50 years, Mesa has been home to the Chicago Cubs during the month of March for Spring Training.